As it stands, The Leftovers is the most spiritual show on HBO’s schedule. But if it holds that God is in the details, Vinyl makes The Leftovers look earthbound by comparison. 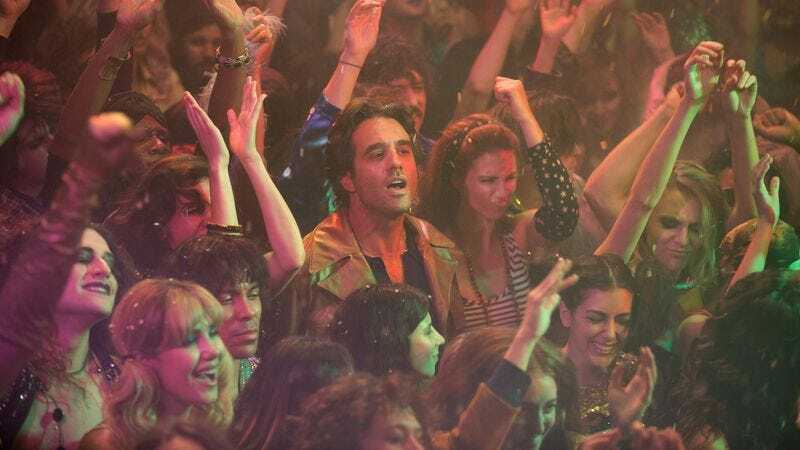 Vinyl, HBO’s drama set in New York City’s orgiastic 1970s rock scene, is crammed full of granular details and precise nuances that go beyond the costume design, set dressing, and prop wrangling expected of a competent period piece. Vinyl brims with authenticity, ecstasy, and reverence for the sweet spot where guitars, drums, drugs, lights, smoke, and a flair for the transgressive intersect. It’s exactly the show its formidable pedigree suggests—a premium cable drama conceived by Mick Jagger, actualized through Terence Winter’s tragic, masculine voice, and filtered through Martin Scorsese’s visual and thematic lens. Vinyl also has little room to grow and no apparent desire to do so, which will be just fine for its inevitable cult audience, but may keep the rock-agnostic at arm’s length. Boardwalk Empire alum Bobby Cannavale ably anchors the show as Richie Finestra, the top banana at American Century, a Manhattan-based stand-in for Capitol Records. Richie is first seen following a stream of equally coked-up influencers into an epic glam-rock show before Vinyl flashes back to an awkward board meeting in which Richie silently frets as he closes a deal to sell the declining American Century to a sterile German conglomerate. In classic Scorsesian voiceover, Richie pines for rock ’n’ roll’s dangerous glory days, when lead singers rolled in broken glass and shredded their vocal cords as a matter of principle. “Now, it’s changed so much, it’s not even recognizable as the thing people used to be so afraid of,” says the flashy, charismatic Richie as he prepares to sell out to a group of Teutonically modest bean counters. Richie decides to revive American Century himself, disappointing his brain trust—head of promotions Zak Yankovich (a comfortably against-type Ray Romano) and head of sales Skip Fontaine (J.C. MacKenzie)—who stood to collect a windfall from the acquisition. That’s technically a spoiler, but only for anyone who has never watched a story about musical ideologists like Richie, who imagine themselves personally responsible for holding the line between art and commerce. After all, if Richie gives into grown-up cynicism and sells American Century for a quick, handsome payday, Vinyl doesn’t have much of a story to tell. But Vinyl doesn’t have much of a story to tell even after Richie takes a principled stand for the integrity of youth culture. The pilot, written by Winter and Breaking Bad’s George Mastras, follows Richie’s evolution from a lowly record man to a self-made giant, introduces his long-suffering wife Devon (Olivia Wilde), and details his feud with Lester Grimes (Ato Essandoh), a promising blues singer Richie tramples on his journey to the top of the charts. (There’s also a major crime committed, though it acts more as a dramatic runner through the first five episodes than a proper plot driver.) But at a nearly two-hour running time, the Scorsese-directed pilot is slack enough to resemble a tyke in his daddy’s studded leather jacket. Not even the relatively permissive God Of Rock gives with both hands, and Vinyl was blessed with the one carrying style, not substance. That said, in terms of its visuals, performances, and general atmosphere, Vinyl is one of the most generous and fully realized shows in recent TV history. Scorsese is squarely in his wheelhouse, with a story set in ’70s lower Manhattan about a smarmy, hair-triggered Italian-American with ambitions that outpace his moral boundaries. (Lest anyone fear a directorial decline in subsequent episodes, the second and third episodes are directed by Allen Coulter and Mark Romanek, no big deal.) The pilot is grand and auteurist enough to justify describing it as “cinematic,” despite the term’s pejorative implications for the television medium. There’s no better adjective to describe what feels like a densely musical Mean Streets revival, complete with bursts of horrific violence that feel at once native and foreign to the seductive environment. It’s not quite as heavy as that description, and some of the visual flourishes are downright playful. Naturally, Vinyl is blanketed with licensed music, including a scene in which Jamie Vine (Juno Temple), an ambitious sandwich girl angling for an A&R position, has no patience for Slade’s “Mama Weer All Crazee Now” as office music. But Scorsese takes it a step further by structuring the musical montages around spirited lip sync performances, as if such greats as Otis Redding are acting as a Greek chorus for the goings-on at American Century. The characters aren’t always deserving of all the fuss, but the performance montages represent Vinyl at its best. The show peaks when it showcases the music its characters are so passionate about, whether it’s The Naughty Bitz, a fictional proto-punk outfit led by Jamie’s beau Kip Stevens (James Jagger), or the myth-making New York Dolls show that opens and closes the pilot. Vinyl feints at greatness, but it has a personality crisis of its own, not quite sure whether it’s more interested in Richie’s implosion or the debauched industry that pushed him to extremes. Vinyl often feels like the former show, if only because of Cannavale’s voracious performance. If ever an actor, a writer, and a director were destined to work together, it’s Cannavale, Winter, and Scorsese, and Cannavale’s all-consuming intensity shows the collaboration’s explosive potential. They’re clearly like-minded artists, and watching Vinyl is like hearing them drunkenly repeat stories Jagger told them at a stag party. But that’s precisely why Vinyl feels narratively hemmed in by its nostalgia. Boardwalk Empire took a more layered view of the Prohibition ’20s, whereas Vinyl’s main takeaway is that everything used to be cooler, sexier, and more fun. That message will resonate for some, and strike others as a sermon about the redemptive power of rock delivered directly to the choir.